The year has ended with a brutal awakening, not just for the People’s Progressive Party but also for all those who have leases issued by the government. Earlier this year some farmers who won their case against the government had their leases revoked. Now it is revoking of a lease to Red House based on an opinion and not a legal decision. For those who feel that the decision to revoke the lease is a case of correcting a wrong, then they are wrong. The APNU+AFC government needed space for an expanded presidential bureaucracy. A foray to relocate and occupy the Walter Roth Museum was rebuffed by loud protests. An alternative had to be found to house presidential staffers. There were not many locations available. Red House became a prime alternative to house the National Trust which had been asked to leave its headquarters on Carmichael Street so as to make way for a presidential media outfit which is doing work which could have been easily done by the Department of Public Information or the Government Information Agency (GINA). Red House was the perfect choice. It would solve the dilemma caused by the rebuffing by the Walter Roth Museum and it would at the same time kick the PPP and Jagan’s papers out of a building which was the first home occupied by the late Premier and President of Guyana during the tumultuous years leading to Guyana’ s Independence. The PPP contributed to the present dilemma it finds itself in. It granted itself, virtually, a token rental for the lease of the Red House. It is not clear whether the company which was granted the lease had the responsibility to maintain the building during the period of the lease. If that were the case then the low lease fees may be justified. There were negotiations on this issue before. The negotiations were about catering for other Presidents papers. The negotiations should have been about increasing the lease fees. The PPP would have consented, most likely, to that request. 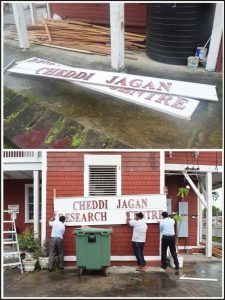 But the original plan was about the building being used as an archive and research center for Jagan’s papers. Then the quest for additional office space emerged following the rebuff by the Walter Roth Museum. The PPP was asked to remove by the end of Old Year’s Day. They took the matter to the courts and a hearing is due in February. This may explain why persons believed to be from the government wanted to take over the facility one day before the time the government gave the PPP was up. The government is afraid of being prevented, by the courts from assuming immediate possession. It is afraid that it may lose the case. It is frightened that its legal arguments may be as fragile as some of the old archival material stored in Red House which now has to be hurriedly crated for removal. Even if the PPP says that it is not moving until the court hearing, it is the government which gave the PPP until old year’s night to remove, one of the shortest eviction notices ever, a mere two days. How can all that material be removed in such a short period? The old bullying tactics have been resorted to. The leopard has not lost its stripes. Guyanese should beware that is how Burnham started his descent into authoritarianism. What is ominous is the head of the public service, Mr Harmon, could be a law unto himself. Placing a politician to head the public service was Granger's original sin. He should have taken the example of Hoyte and place a non-politician to head the public service. Harmon must not be sending people to bully anyone. Let the courts and police deal with the matter. I see some PNC supporters are jumping for joy without seeing the irony and danger. I do not understand the logic of having the Minister of Social Protection staging a counter protest next to the PPP protesters. This smacks of unprofessionalism and bullyism. I agree. She should be disciplined. Has no right being there. Human have the tendency to become bored and seek change for the case of change. Unfortunately their choice was for the worse. I saw some videos on FB,very unpleasant scene,portrays a turf war between Indos and Afros,Guyanese politicians are at the bottom of the ladder. Battle for the survival of the fittest. Coolies will not just sit down and be bullied anymore. I hope they fight fire with fire. Their survival is at stake. Django...could you post videos here? QUOTE: "Guyanese should beware that is how Burnham started his descent into authoritarianism." Wake up, Django. Gilbakka already wake up with a jolt. As I love to say, coming events cast their shadows beforehand. I see darkness ahead over Guyana. The APNU+AFC regime has made a series of indefensible moves since its accession to power 19 months ago. Worse is progressing to worst. Those of us who have supported the Coalition and who have a Conscience MUST STAND UP and let the Coalition know that we refuse to rubber-stamp their actions. And we reserve the right to walk away from the Coalition as I did yesterday December 30.
this generation of Indos got power they stand up for their rights,not like kabaka time when you were falsely charged for arms. I hope the 60's don't return it will be catastrophic on both sides,the politicians have to be cautious,they have to avoid inciting the people. Granger dictatorial nature has been revealed. Moses and Prak should threaten to withhold any critical support or to break away from the coalition. No more critical support from me to this coalition. This lease now. What's next. i will give a shot later. Moses don't have no balls to stand up to anyone. How about Volda Lawrence? What her size? Your statement is sexist. It can't be done like that. Moses and Khemraj made major mistakes by not continually consulting their core supporters. my greatest concern is for the people,distrust is alive between the two major races. The PNC and PPP are no good for Guyana,that country is doomed with the two party around. True. I see the disenchantment here in TO among their supporters. Some are suggesting they cross the floor if that's possible. They will have to have consultations with all members,if that happens surely it will put a brake on the PNC lawlessness. Why a candlelight vigil by the PPP/C last evening attracted a counter-protest led by Minister of Social Protection Volda Lawrence? This is a dangerous situation. It seems like Burnham days are back. Moses Nagamootoo and Khemraj Ramjattan have important choices to make. They can bury their heads in the sand and believe everything is hunky-dory. Or they can listen to the misgivings, questions and cries of AFC members and supporters, failing which the AFC will become DEAD MEAT to be devoured by the jackals of history. I know some of you are Moses followers. That man is a Neemakharam he will not cross the floor. He is a follower not a leader. I don't think AFC will do anything, but I would like to be pleasantly surprised. Why wait for the termination of the lease to judge the coalition. From day one when they took 50% raise, choose not to help the rice and sugar industry, is the straw that breaks the camel back.We in N/A and else where will have to apply pressure. This coalition has taken a Military/Racist route, the people of Guyana cannot wait three more years to suffer. LOL! you are contradicting yourself. Most of them are BRAIN DEAD IDIOTS, you should not be surprise. I think it was you who said, Granger dictatorial nature has been revealed. Moses and Prak should threaten to withhold any critical support or to break away from the coalition. That's what I meant, breaking from the coalition would be akin to crossing the floor because if they do break away there will be a vote of no confidence in parliament. Not sure where is the contradiction. Tht Namakaram Crabdaad Parasite said the KFC will be the guardian of Fairness and Justice. Uncle Tom probable cheat on his Friggin Law Degree. Bloody IDIOT!!!! The PNC/AFC have finally fulfilled their promise of retrieving state assets stolen by the PPP. The Red House is their first of many state assets stolen that will be returned to the Guyanese people. Next up will be the Sanata textile complex given away to Bobby. Go Granger! You used the word "not." नमक हराम namak haram means disloyal. If "he will not cross the floor" as you said, then he is loyal. Samjhe? I said Neemakharam not namak haram. Ask Nehru Neemakharam means crabdaag. I get the impression they are into it for the personal benefits and prestige than to leave a great legacy. Both can be achieved together. They alienated all the second-tier guys who supported them and wrote to support them. They underestimate how important these things are. They should have kept the party structure. That intellectual support could only win them respect in cabinet meetings. Granger dictatorial nature has been revealed. Granger is stubborn, but passive aggressive. Look to Harmon to see the true cause of the problem. But then docility is the nature of the Guyanese, in addition to being opportunistic. APNU AFC will do as much as the population allows them to do. If the population doesn't like it they need to stand up to it. If they allow it, then obviously they aren't bothered by it. By the way the PPP screams are silly when it is known that they were bullies who resorted to violence against the few bold enough to speak against them. Freddie K, Eric Phillips, David Hinds and others can fill in the gaps. This is why opposition to APNU tactics must come from civic society. People who aren't blemished by the bullyism which was a defining aspect of he Jagdeo era. Caribj, your analogy doesn't hold water. The Red House is a sacred institution like Burnham's house. Granger is flexing his muscle by not using the court system and following blindly Soft Willie advice. What was that ghetto Volda Lawrence trying to prove? Why would a Minister. a paid public servant, Volda Lawrence be allowed to counter-protest or even protest it's people. Absolute Dictatorship. Hear nuh, the hindi word for Crabdaag is रकून "rakoon" . Pt. Nehru speaks bhojanpuri hindi. Mits, you taking a bold stand here. Just wondering...Would you have a problem if the material for ALL previous Presidents were housed in the Red House? Looks like Volda's balls are bigger than Moses and Ramjattan put together. Perhaps they should be housed in their respective residences if possible and their homes be declared as museums as I have seen over the past 20 years visiting the 7 continents of the world.